Van Insurance or Commercial Vehicle Insurance as it is sometimes called, is a very common type of policy but it is still fraught with difficulties. This is why we would always recommend you use an insurance broker. If you source the policy yourself online and get it wrong, this can prove to be very costly and who do you blame…? As possibly the top insurance broker in the West Midlands (according to the Chartered Insurance Institute no less) our team here at Prizm has insured every kind of vehicle for over a decade. The main issues we run into when arranging Van Insurance are who owns the vehicle, what is it going to be used for and who is going to drive it? Honesty is not only the best option. It is the only option. Because if you lie to get your premium lower then it is increasingly easy for an insurance company to walk away and reject your Van Insurance policy, just when you need their help – in the event of a claim. 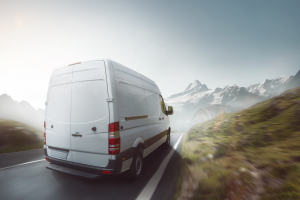 Any Driver policies are becoming VERY expensive so the vast majority of insurance policies for commercial vehicles including Van Insurance are now arranged on a named driver basis. Don’t forget – if you have multiple vehicles which you need to insure, a fleet policy may be far better, cheaper and easier for you instead! See our Fleet insurance page for more details. When we arrange your Van Insurance we will also need to know what the vehicle is going to be used for. There are two main classes of use – carriage of own goods (ideal for retailers and tradesmen) vs. hire and reward (couriers and hauliers). It is significantly more expensive to insure a van for hire and reward because statistics prove that light vehicles being driven for courier/haulier work have more accidents and/or bigger accidents. Certain trades also attract higher premiums for their Van Insurance because of claims. Conversely certain trades get charged less, because their claims record is traditionally far better. Our specialist insurance broker software takes all of these factors into account so that we can provide you with the best premium for your Van Insurance that can be sourced from ‘A’ rated (or at the very worst, ‘BBB’ rated) insurers. This is really important because there are so many overseas insurance companies now trading in the UK, one of the best ways to establish if they are worthy of your business is to see if independent agencies have checked their credit status and made sure they are ok.
Another common misunderstanding with Van Insurance, is that it is often assumed the policy covers the goods on board, be it tools, stock or customers goods being delivered. No. it doesn’t, you’ll need separate Goods in Transit Insurance as well. When we talk to you about your Van Insurance we will often suggest you consider optional covers too such as Motor Breakdown and/or GAP Insurance – which at its simplest provides new for old insurance cover on your vehicle and/or clears the finance off if there is a shortfall following a total loss. What can help with spreading the cost of Van Insurance over 10 or 12 months and what makes Prizm Solutions different from most brokers offering this sort of policy is that in most cases we don’t take a commission from the insurance companies for placing the business with them. We believe that working for a fee is more ethical and transparent and you as our customer are sure we are recommending the best Van Insurance policy for you from the best insurer for you. Please give us a call on 01827 313 931 or email us via our contact us page. We look forward to providing you with a quotation.